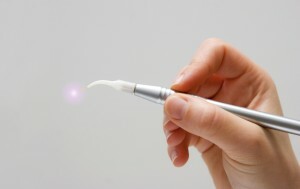 Lasers have helped change the lives of many people in different fields, including those with oral and dental problems. Although the use of laser in dentistry is still not as widespread, it has been used to positive effect in the treatment of various dental conditions, including gum disease. Periodontal or gum disease is an infection that mainly affects the supporting tissues and bone that’s responsible for holding your teeth where they are. The condition affects everyone, from children to the elderly, but is much more common in adults their 30s and older. Gum disease may be the result of many things, such as poor oral hygiene, genetics, smoking, diabetes and other chronic illnesses, and even medication. If left to progress, gum disease can affect the gums so much that the roots may start to become exposed. This can cause pain, sensitivity and other problems. Typically, gum disease in its later stages is treated via scaling and root planning. This is a non-surgical method where the dental care professional cleans the surface of the teeth. Also, if necessary, the dental care professional may resort to gum flap surgery. This is a surgical procedure where the gum tissue is cut and flapped back to allow for the thorough cleaning of the roots underneath. Once finished, the dental care professional then sutures the gum tissue back into place and leaves it to heal. Laser gum therapy or treatment is an alternative to scaling and root planning, as well as gum flap surgery. It’s a procedure where the dental care professional uses a dental laser to access and remove the inflamed gum tissue that’s surrounding the root of the tooth. Once removed, the root is left exposed and this is where scaling begins. This involves scraping off all the built-up bacteria from the teeth, gum line and around the teeth. The root is then smoothed off using laser and instruments, removing any rough spots that may attract bacteria and cause infections in the future. What Makes Laser Gum Therapy Different? The main benefit with laser gum therapy is that it requires no general anesthetic, which helps minimize complications resulting from anesthesia. The lasers are also more accurate, able to target the diseased areas with better precision. Also, unlike regular surgery, there’s less bleeding, pain and swelling involved with laser gum therapy, which also means that recovery and healing times are much shorter. Of course, you wouldn’t have to worry about the risks of laser gum therapy, or any other kind of periodontal treatment, if you take good care of your teeth. You should make sure that you brush your teeth twice a day for two minutes each time and floss at least once daily. You also may want to use an oral mouthwash to rinse your mouth, preferably one that doesn’t contain alcohol. More importantly, make it a point to schedule an appointment with your dentist at least twice a year for checkups and professional cleanings. If you feel that you would benefit from laser gum therapy, contact Dr. Clive Rosenbusch, DDS at 561-394-7888 to schedule a consultation today or visit www.cliverosenbuschdds.com for additional information regarding laser gum therapy. The latest Fotona Lightwalker laser a dual wavelength laser is used.